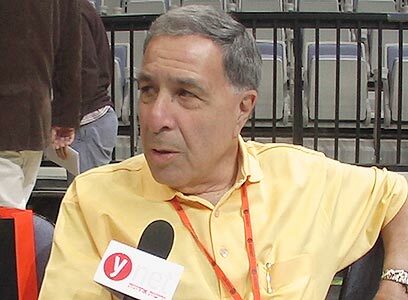 Throughout his 38 years as the chairman of basketball powerhouse Maccabi Tel Aviv, Shimon Mizrahi won a number of lucrative group prizes – now he can add a personal significant accomplishment to the list: Time Magazine listed him as one of the world's 50 most prominent sports execs. The famous American magazine chose the top executives in all fields of sports from a list of thousands. "Players win championships but executives pick the players," editors wrote as they invited readers to rank their favorites. Berlusconi and George Steinbrenner, principal owner of the New York Yankees. Now it will be up to readers worldwide to determine Mizrahi's final spot on the list. "It's a great honor to be included in such a list alongside people like David Stern, but the honor is not personal – it belongs to the State of Israel and Israeli sports," Mizrahi told Ynet. Mizrahi (67) was nominated temporary chairman of Maccabi TA in 1969, but has stayed in that role ever since. Under his leadership, Macabbi has won the Israeli championship 37 times and claimed five European titles. See all talkbacks "Shimon Mizrahi on Time list of 50 best sports managers in the world"